It’s been nearly a week since my grandma’s memorial, and I’m still taking it all in. 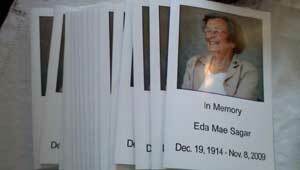 Eda Mae Sagar passed away on Nov. 8 at the age of 94. About 60 people turned out to the Knights Ferry Community Club, a rustic little building on Main Street. The crowd inside included family, friends from long ago as well as bridge partners and others who live in and around Oakdale. As I stood up on the stage giving a short eulogy, I half imagined that she might just walk in the front door and start visiting with all of those she loved so much. I talked a little about her long, rich life, as well as her kindness, class and courage. But what I really enjoyed hearing were the stories told by others — tales of fun times, visits to her beloved San Francisco and countless examples of her wonderful style and grace. We ended with a dessert buffet — including angel food cake, which she made often — and a champagne toast in her memory. We couldn’t have put everything together without the help of family and friends. It was the kind of gathering my grandma would have loved, and I know she was there in spirit.